Japan is a small country. It's people are generally small, and they excell at making small things, like cameras, mobile phones, dogs and food portion sizes. All this smallness is pretty neat, but Japan doesn't always like the stereotypical associations with being 'little' in so many ways, (especially the men), and sometimes finds itself needing to remind the world that hey, we make big things too! Unfortunately though they still don't quite 'get it' yet. 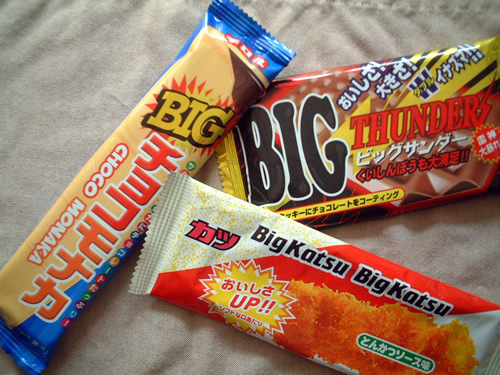 Somebody decided that writing 'big' on some cheap snacks would go a long way to improving Japan's image. So what does Japan consider big? 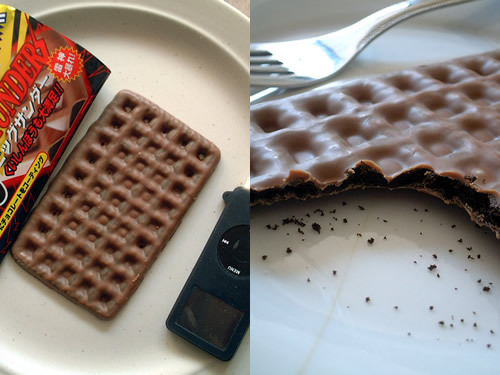 To measure their relative bigness, I paired them up with my standard 4cm x 9cm Ipod Nano. First up is the BIG Choco Monaka. Hmmm, I wonder what the regular sized one looks like. 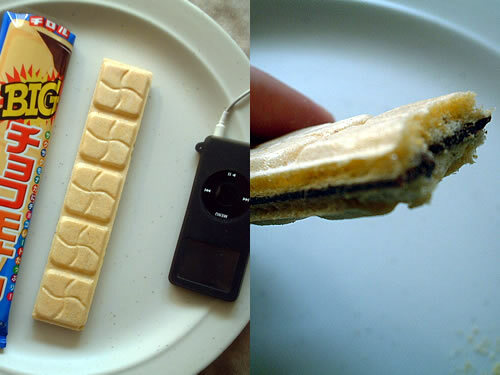 Ok it tastes pretty good for a microscopic bit of chocolate and some ice cream cone, but before you get too excited, keep in mind that you're paying money for a package with one cookie in it, while in North America, wafer cookies come in packs of like, 100. Next up is 'BIG THUNDER' which has scribbling all over the package to help convince you that this thing must be a monster indeed. The top of the package screams (in Japanese): Taste! Size! Double Lightning!! It goes on to say stuff like 'Super Satisfaction!!' and 'Rage of the Thunder God!' to insure the point is driven sledgehammer-like through your skull. However it turned out to be a distinctly dumpy and boring looking slab about the size of a cheap TV remote. Some fake, runny chocolate surrounds an oreo-like cookie thing which had a strangely salty taste and left me feeling vaguely ill. I doubt the Thunder God would be too impressed. Most people in Japan know Katsu as a fried and breaded piece of meat, usually pork. 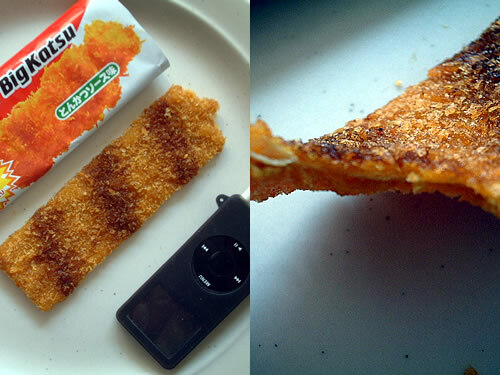 However the makers of Big Katsu had a novel idea. They were like "Hey, let's do away with the meat and just sell the fried breaded part by itself! Not only that, let's package it with some chemicals and preservatives that give it a stale, dead taste so it can sit on shelves indefinitely! Yeah! Hold on though, we better paint some stripes on it that people will think is soy sauce, oh and we'll stick a piece of tofu skin in the middle just so people don't think they're getting ripped off." How the 'big' got involved in this mess though is still a mystery. Seems like during all the fuss in writing 'big' on the packages, actually making the snacks big was a secondary concern. Well better luck next time Japan. Just remember, bigger isn't always better. Take pimples for example, or uhhh... cauliflower, or Microsoft. See? you just have to be positive with what you have.